Located on the first floor of the Metropolitan Museum of Art is the Museum’s European Sculpture and Decorative Art collection. 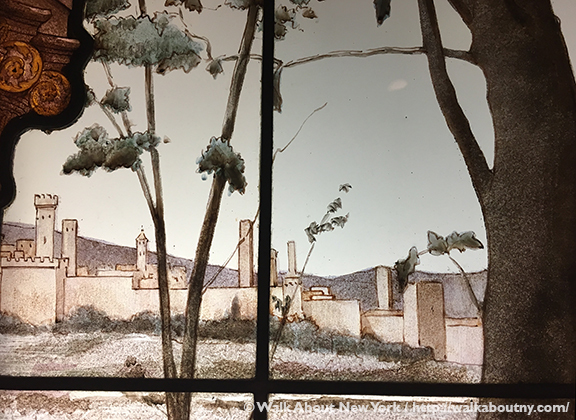 Among the works on display are the stained-glass panels from a bay window that were once in the home of the successful cotton broker, Isaac Bell (1815–1897). The Bell family lived at the Knickerbocker Apartments, 247 Fifth Avenue. Constructed in the early 1880s, this was one of the first luxury apartment buildings in New York City. “La Danse des Fiançailles,” detail. A uniquely attractive feature of the apartments at the Knickerbocker was that they were full-floor duplexes, like a two-story house. The living rooms, which included the parlor, library, dining room, kitchen and pantry, were located on the lower floor with 12-foot-high ceilings; on the upper floor the bedrooms and bathrooms were arranged but with more intimate ceiling heights. The Knickerbocker was also one of the first co-operative apartment buildings in New York City. A co-op, as they are called, is not a condominium, which comes with a deed to property; but it is a form of home ownership. The resident buys shares in the corporation, whose only purpose is to own the building. The shares entitle the resident to live in an apartment that is assigned to those shares. By 1888 the building’s developer bragged that he had sold almost $4 million worth of apartments at the Knickerbocker. 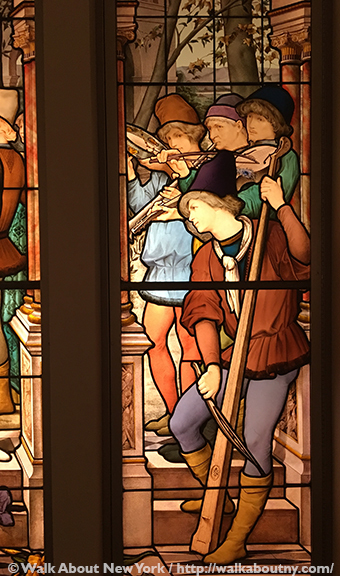 Mr. Bell commissioned these stained-glass panels from French decorative designer Luc-Olivier Merson (1846–1920). 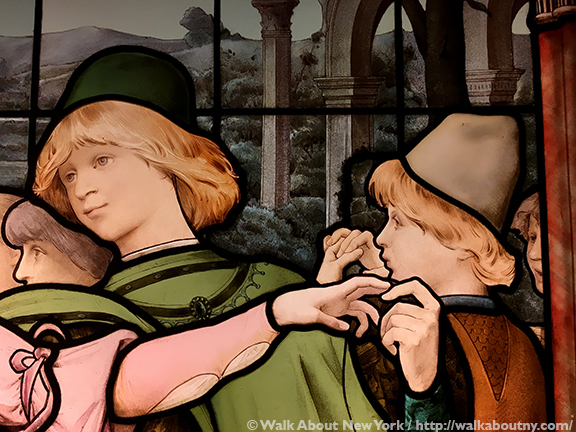 They were produced by stained-glass manufacturer Eugène Oudinot (1827–1889) at his atelier in Passy, an area of Paris. He also has created windows for ecclesiastical and secular settings. Monsieur Oudinot opened his studio in 1854 after studying with Eugène Delacroix. Monsieur Merson has a number of celebrated decorative design commissions to his credit, including the mosaic on the chancel vault of the Basilique du Sacré-Cœur, Montmartre Paris. “La Danse des Fiançailles” detail. 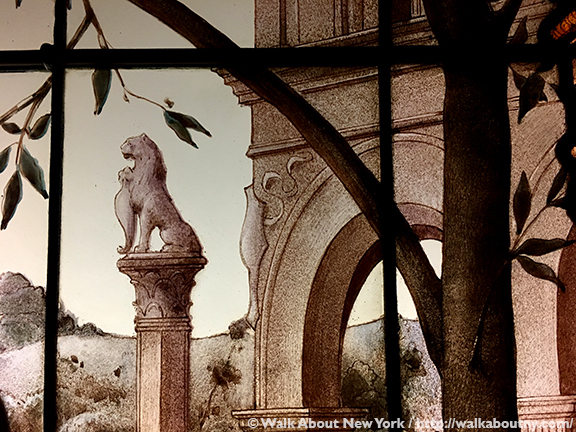 A drawing, known in design parlance as a cartoon, by Luc Olivier Merson for this stained-glass window is part of the permanent collection of the Art and Archaeology Museum at Beauvais, France. 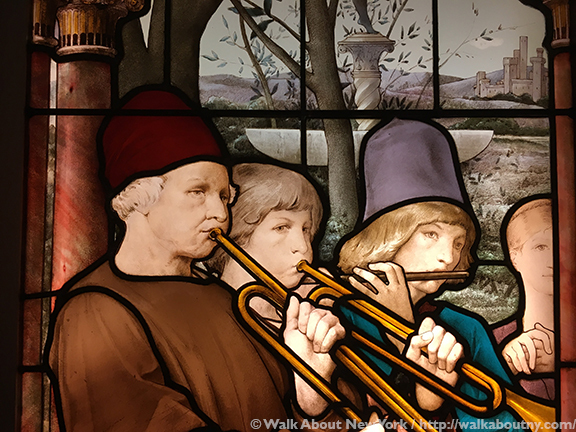 The romanticized scene, typical of the 19th century Neo-Gothic style, depicts a celebration. It is the betrothal or engagement, of a young couple, shown in the center panel. Across Europe noble and aristocratic families of the Middle Ages and beyond, entered into marital contracts with the aim to strengthen political or business relations, using their children as bargaining chips. “La Danse des Fiançailles,” detail, the designer, manufacturer and date. Wearing period costume, the young couple lead their guests in a pavane; this is a slow, courtly dance to the accompaniment of musical instruments. Proceeding down the steps, strewn with flowers, they will be greeted by family and friends where the festivities will begin. 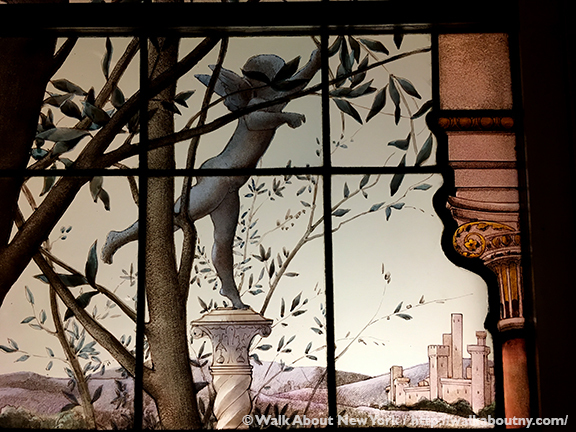 By placing the young couple at the center of the action the designer made them the focus of the window. “La Danse des Fiançailles,” detail, the rose of Venus. Set at a villa in the countryside outside the city-state of Florence, which can be seen in the background, the artwork is titled “La Danse des Fiançailles (The Engagement Ball).” The window is made up of many pieces of colored glass, forming the costumes, instruments, and much of the architecture; but the facial features and some of the building decorations are painted onto the glass. Symbolism runs throughout the scene. Images connected with Venus, the Roman goddess of love, appear several times. 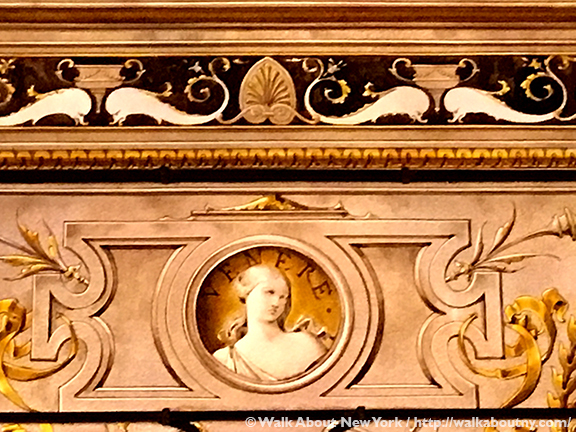 A portrait of the goddess herself can be seen above the arch in the left hand panel. The figure of Cupid, Venus’ son with Vulcan, balancing on his left foot, can be seen through this arch. 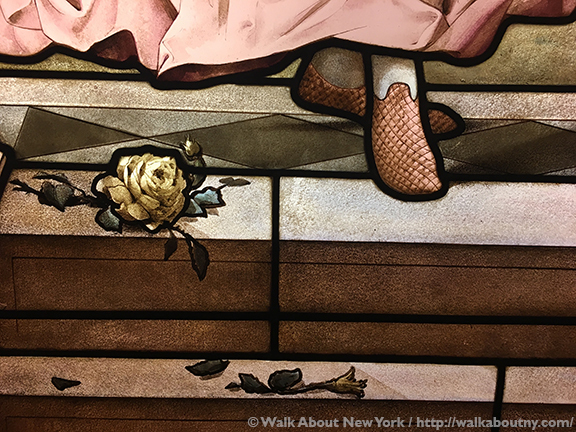 A rose, the attribute of Venus, is near the foot of the young woman in the center panel. 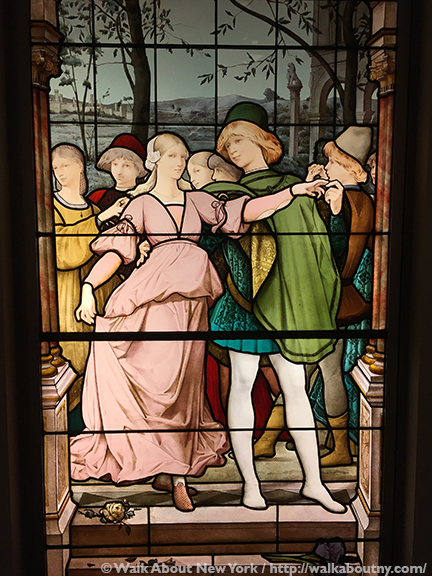 “La Danse des Fiançailles,” detail, the City of Florence. In addition to the walled city of Florence, shown in the background, symbols of the Florentine city-state are also part of the scene. One of those symbols is the Marzocco, a lion with his right paw on a shield sits on a pillar above the left shoulder of the central male dancer. The lion was chosen because it can tear apart the eagle, symbol of the Holy Roman Empire. Even today in Florence’s main square, Piazza della Signoria, the most-celebrated Marzocco can be seen. “La Danse des Fiançailles,” detail, the Giglio of Florence. Florence is closely identified with the lily, or giglio. It is on the shield that the Marzocco rests his paw on, and can be seen throughout the city. Two lilies can be seen below the foot of the future groom. 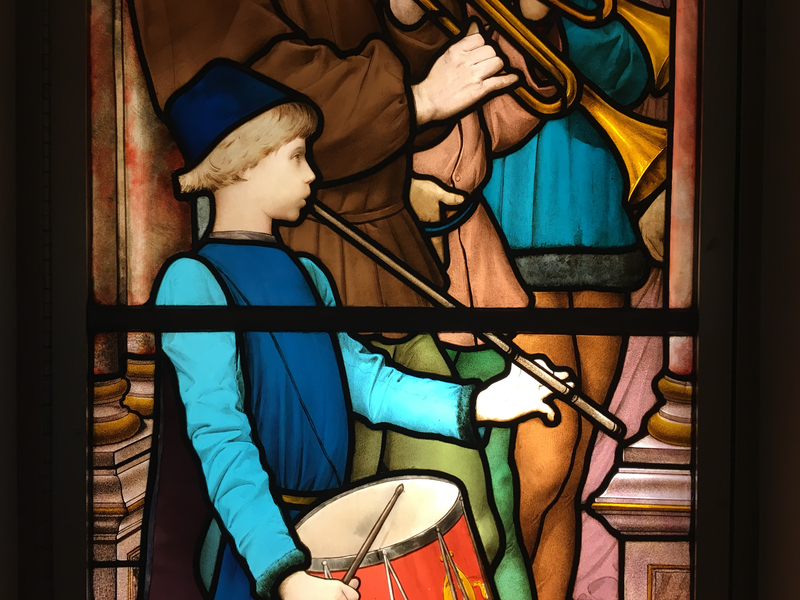 The very stylized lily also decorates the boy’s drum in the left panel. 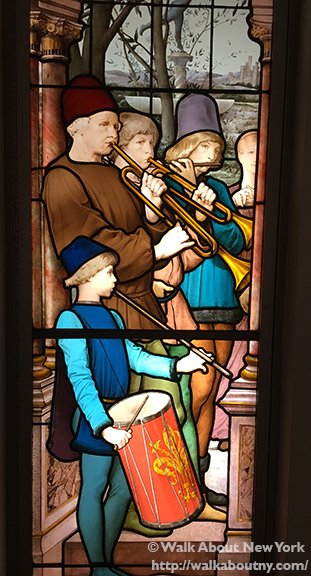 Traditionally the giglio is red, not the case in this stained glass version. These irises are purple and yellow. “La Danse des Fiançailles,” detail, Mars. 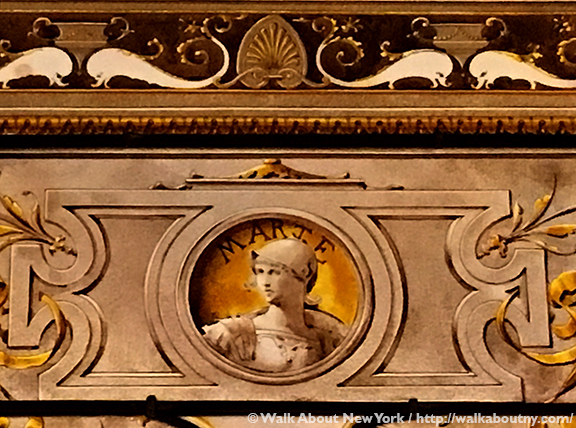 Above the arch in the right hand panel is a portrait of the Roman god of war, Mars. He and Venus fell in love. This unlikely union symbolizes that love can conquer all, even an arranged marriage! “La Danse des Fiançailles,” detail, Cupid. 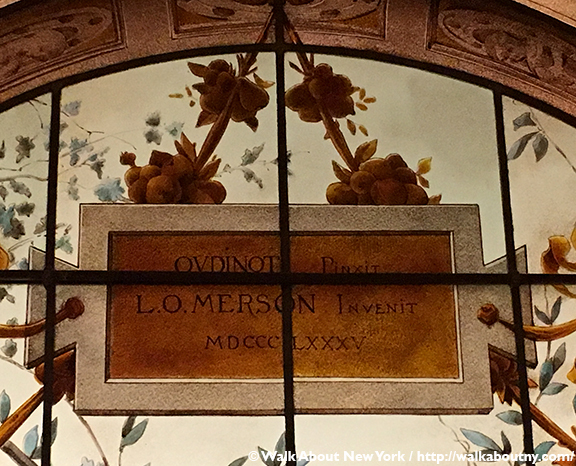 Adelaide Mott Bell, widow of Isaac, continued to live at the Knickerbocker until her death. 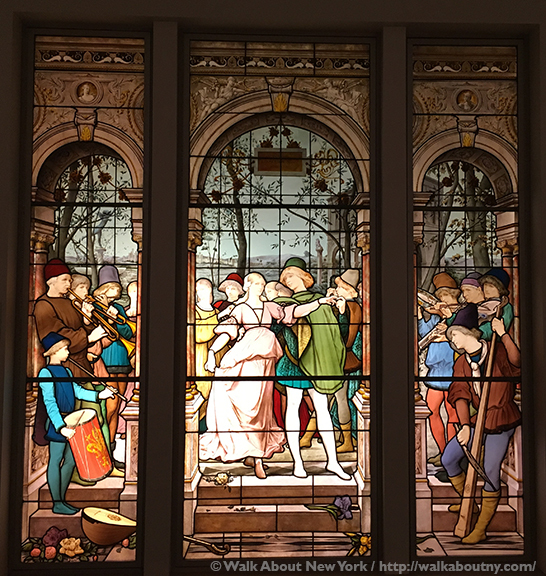 The 1885 window was her bequest to the Museum. Removed from the couple’s apartment in 1906, its dimensions measure 96″ high by 120″ wide. “La Danse des Fiançailles,” detail, Marzocco. 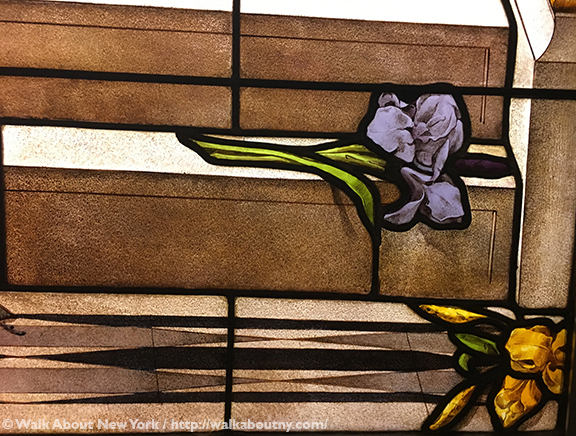 Mr. and Mrs. Isaac Bell and other family members are at eternal repose in Green-Wood Cemetery, a National Historic Landmark in the borough of Brooklyn. Mr. Bell died in New York, Mrs. Bell in Paris. “La Danse des Fiançailles,” detail, the future groom. 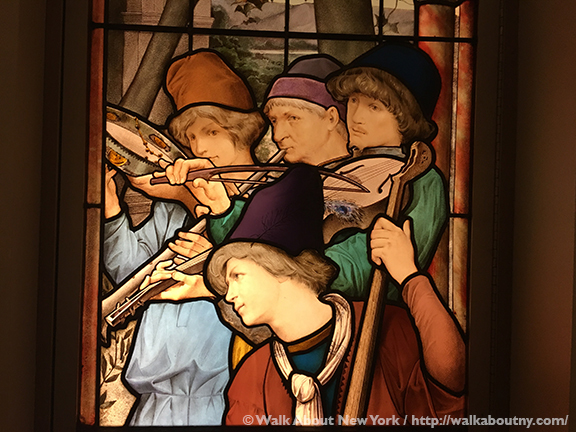 Read our other articles about artwork in the permanent collection of the Metropolitan Museum of Art or that were part of special but temperary exhibitions held there. 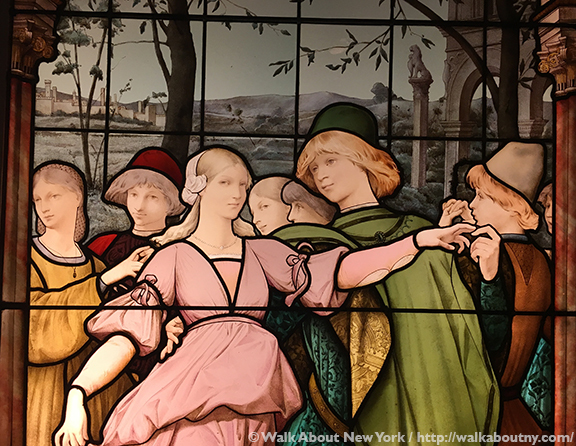 Arrange your Specialty Tour of the Metropolitan Museum of Art, the single-most visited sight in New York, to see great and beautiful things. Take the Tour; Know More!